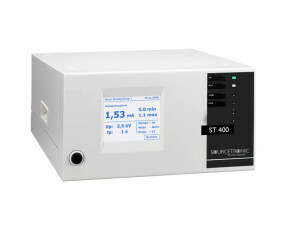 At the productronica 2013 Sourcetronic presented the new Electrical Safety Tester ST400. That all-in-one electrical safety tester is made for every VDE- and EN-test. Fairgoers were especially interested in its consolidated design and numerous possibilities of gauging, like the tests for high potential AC and DC, isolation, protective conductor and ground leakage. This Electrical Safety Tester of a new generation running with Linux system software combines everything, including SPI-ethernet gateway. It is particularly distinguished by features such as diagonal building technique, standard electrical socket (at costumer’s opinion country-specific), Touch Screen and autorun function. With regards to health and safety in the workplace the electrical safety tester ST400 is first class. It can be used straight inside ranges of production or laboratories without any preventing or marking because of the safety current limiting. Optimal conditions guarantee safer measuring.